Whilst reading this month’s edition of Good Homes magazine I came across a lovely story on the back page, about business mum Katherine Morris and her own wallpaper design business. I loved the designs so much I’ve made this one Wallpaper Wednesday for this week. 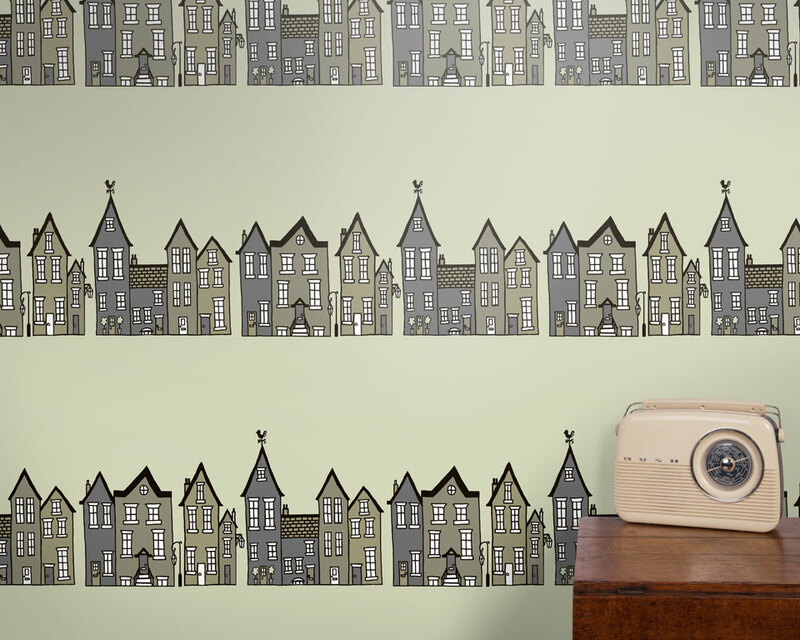 The Street is a small snapshot of Katherine’s home town in Shropshire and comes in two colourways. I love it’s quirkiness and simplicity and the fact that it has a matte finish with a subtle glitter texture. The biscuit colourway even has glittery houses! And even more cool than that, The Street is a horizontal wallpaper so bear that in mind when you buy it. Great for a country property, without being fussy or twee. Or in the suburbs on a feature wall, this would look fabulous in a modern house too. The Street is available at Earth Inke and retails for £69 per roll. Samples are available too. Oh Jen I absolutely love this!